Part 1 of 2: This is a truly special episode today. I recently had the pleasure of interviewing Andy Brown, author of the book Warnings Unheeded: Twin Tragedies at Fairchild Air Force Base. This book is a recounting of two tragic events that happened within days of each other at Fairchild AFB–a B-52 bomber crash and an active shooting that killed 5 and wounded many more. Andy was the man, then an Air Force Security Police airman (now known as Security Forces), who stopped the individual responsible for the heinous attack at the base hospital. 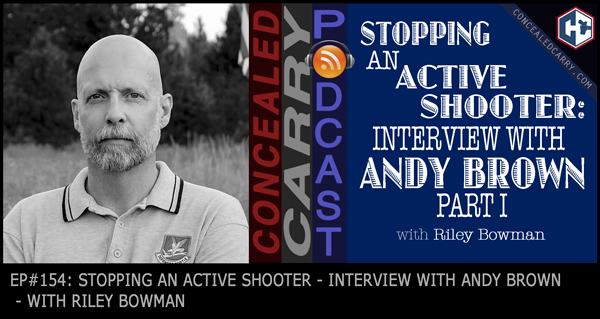 It is not often you get to hear first hand from a man with his kind of experience and knowledge, so tune in, take some notes, and determine what you need to do to better prepare for your worst-case scenario. Press ‘PLAY' above to listen now! Lieutenant Dan Marcou's 5 Phases of a Mass Public Murderer – read this, it is a good read!